With the death of Bridge and their unborn child, Jacob left Idaho and moved home to Oklahoma. His life spiraled out of control and he sought out to comfort his pain in ways he never imagined possible. The fire that burned deep inside of him to utilize his paramedic skills helping people, extinguished. Each time he looked in the mirror he didn’t recognize the man that stared back at him. His mere existence depended on the crutch he grew to depend on. Will he find his way back to the man he used to be, a man that his father was proud of, or would he continue to destroy himself? WOW!! Jacob Myers is back with vengeance!! I love this series, it gets better with every book!!! With every bit of the intensity as the first two novels in the series and more! The author connects the world of EMS with mind boggling, emotion gripping roller-coaster of suspense, human character, and action. 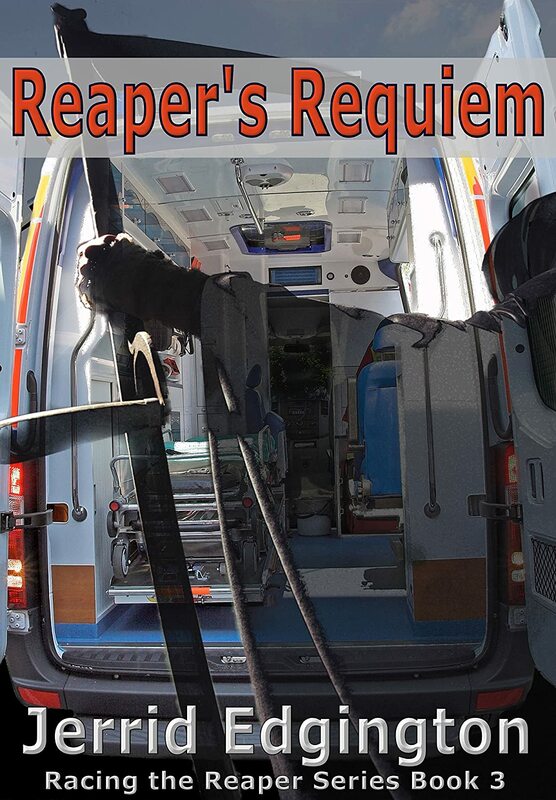 The reader will sift through every emotion Jacob does as he finds his way back into the profession of a paramedic and what comes next is mind blowing!! This book will have you at page one, and with page turning suspense with an jaw dropping ending that you would never guess! I highly recommend this series to anyone in the medical field, and everyone who is not. I have read all three books back to back and the series flows with such high intensity I can only hope there will be a book four. Jerrid Edgington has delivered another novel that will not disappoint and of such brilliant talent!! The Reaper Returns, will be released in 2015. 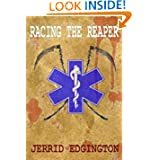 Author Jerrid Edgington is a Paramedic at Le Flore County EMS in Poteau Oklahoma. He has been in EMS for 17 years with 15 years of that as a Paramedic. Jerrid Edgington is a Paramedic for Le Flore County EMS in Poteau Oklahoma. He has over 17 years of experience in the field. Jerrid has worked in Phoenix Arizona, Boise Idaho, Spokane Washington, Moses Lake Washington, and now calls Poteau Oklahoma his home. He is married to Jody Edgington, an ER Nurse. Jerrid, thank you for spending time with me in the Potpourri Parlor. You are writing a series of books based on EMS and you are a Paramedic – What made YOU choose a career in EMS? How much of your actual life in EMS is reflected in your novel(s)? I didn’t choose EMS, it chose me. When I was 22 years old I suffered a spinal cord injury that left me 100% paralyzed. After four days, I regained limited movement on the right side of my body. Over time, I slowly regained movement throughout my body. I spent two months in the hospital learning to walk again, care for myself, and do normal everyday tasks. After a year, I was completely healed and didn’t have any deficits. Up until that point, I worked as a tool salesman. After my injury, I took an interest in the medical field, became an EMT, and after two years of working on the ambulance I went to Paramedic school. I truly believe that God put me into the direction I needed to get into EMS. Before that injury, I had no interest in the medical field whatsoever. A lot of my life in EMS is reflected in my books. I would gather to say around 50% of the situations I put in my books were from experiences, the rest was pure imagination. What three words do you think describe you as a human being? Caring, compassionate, and tolerant. I believe those are three things that are vitally important traits to have as a Paramedic. Not all calls are life or death. So you have to be tolerant as what some people consider an emergency isn’t so much to the trained professional. You have to love people and respect life. I’ve seen too many people, over the years, use their job as a way to be a control freak. I’m in the field because I believe God put me there. In your novels, is there a character you love to hate? Why that one? I would have to say it’s Dr. Young in my second book, Racing the Reaper-Resuscitation. He was a complete jerk and tried to control Bridge. He let jealousy cloud his judgment and tried to get Jacob into trouble every time he turned around. He remained cold and callous all the way through the book to the end. In one sentence—what do you want people to say about your writing in fifty years? I hope they will say that I was a very talented and passionate writer. What were your thoughts when you made your first sale as an author? I was in complete shock when my first book sold. And when the sales kept coming, it was an unbelievable feeling of elation. If I could bottle up that feeling and sale it, I would be a millionaire in a heart beat. I still feel that way each time a book sales. When I started writing, I never thought in a million years that my books would be read as much as they are. I receive messages all of the time from readers telling me how great the books are. And I find it very humbling. I don’t feel like I’m a great writer, yet. I still have a lot to learn. What is the hardest part of writing your books? The hardest part, for me, in writing my books is the rewrites and edits phase. If I could sit down and write the book perfect the first time, I would be extremely happy. By the time I finish rewrites and edits, I want to throw up I’ve read my work so much. Lol. It’s a necessary part of the writing process. But not my favorite part in the least. I would have to say that Candace Calvert has influenced me the most. She’s a retired nurse that writes medical fiction, like I do. I read her books and I’m completely amazed at how well she is at describing imagery. I feel like I’m in the middle of the scene I’m reading. I’ve been lucky enough to trade e-mails with her often, she’s truly my inspiration. What would you tell someone who wants a career in EMS? I would tell them to really sit back and think about why they want a job in EMS. It’s a low paying job and can be very difficult at times. If they have a passion for helping people, then EMS is the right job for them. I often wonder if I should’ve gone into nursing, rather than becoming a Paramedic. But I know I wouldn’t be happy. There is so much freedom in EMS and the system I work in has extremely progressive protocols. We are lucky enough that we get to treat our patients without having to call in for orders. Do you have any suggestions for beginning writers? If so, what are they? The best piece of advice I can give is for beginning writers to read A LOT of books by writers in their genre. It’s very important to see how others write and it helps you develop a writing style. The second piece of advice I can give is to have your work professionally edited before you publish a book, if they choose to go the self publishing route. You can lose a reader if your work isn’t pristine. I learned that one the hard way on my first book. The best letter I received was from a reader that had been in the EMS field for a very long time. She loved how my first book chronicled the the main characters experiences as a rookie in the field. Our job is very hard and a lot of people get into thinking they’re ready once they finish their training. My first book showed how hard it is in the beginning as a rookie. It also showed a side of EMS the normal person doesn’t know or understand. I always thought that when someone called 911 it was life or death before I got into EMS. It didn’t take long for me to realize that wasn’t the case. She said she was going to buy extra copies of my first book to hand out to anyone interested in starting an EMS career. That made me feel very good. Can you tell us where to find more information on you? Website? Blog? My website is http://www.jerridedgington.com. I have a blog in production and will announce that address on my website once it’s complete. Is there a place where readers can reach you? My readers can reach me through the contact page on my website or directly at jledgington@yahoo.com. I want to personally thank each and every one of my readers. I love to hear their thoughts on my books and appreciate everyone that has posted a review. I couldn’t do this without their support. Again, thank you. Often mislabeled ambulance attendants, ambulance drivers or even band-aid bunnies, the people who respond to 9-1-1 and other calls for emergencies are trained, skilled, dedicated and often courageous individuals. EMTs and Paramedics are usually the first professional care medical and trauma emergencies receive pre-hospital. What I am most impressed about by Mr. Edgington’s tale is the very insightful human factor he focuses on. As an EMT myself (for nearly 30-years) I found it easy to relate to the thrills, fears, satisfaction and sometimes loss that the characters experienced. I chuckled when the author described some of the non-emergency 9-1-1 calls the ambulance crew was dispatched to, and found myself holding my breath as rescues were being made. Yet as real as the descriptions of calls and treatments were, the story still read as entertainment and not textbook. The ending which truly left the reader wanting more is a terrific prelude to a sequel (which I understand is well on its way! ), one which I will certainly be waiting to read.